And with Rich Eisen's dash, the 2013 NFL Scouting Combine has come to a conclusion. 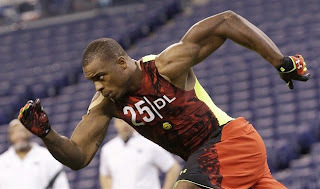 Many prospects, such as the pictured Dion Jordan of Oregon, greatly helped their draft stock, while many have hurt their stock for a variety of reasons. So with all of that, how does the 2013 NFL Draft look right now? Let's take a look at my post-combine mock. Alex Smith is the new guy under center for Andy Reid and the Chiefs and the team has not ruled out by any stretch drafting a quarterback later in the draft. But regardless of who their quarterback is, Kansas City has to upgrade their pass protection as they gave up the 11th most sacks in the league this past year and with left tackle Brandon Albert being a free agent, the team should look to take Joeckel or Eric Fisher with their first selection. Joeckel has every skill that you want out of a franchise left tackle and he was brilliant this past season, playing a key role in Johnny Manziel's Heisman campaign. Floyd's draft stock has been rising and he now appears to be a lock for the top ten, and seems like a relatively safe bet for the top five at this juncture. It looks like Floyd can play either the 4-3 or the 3-4, which new coach Gus Bradley will appreciate as he likes to feature multiple defensive looks. Floyd is a very disruptive presence from the interior of the line and he showcased tremendous athleticism for a lineman. Jacksonville needs talent across the board, particularly on defense and especially on the line with the team finishing last in the league in sacks. Speaking of teams that struggled to rush the passer in 2012, the Raiders were just as bad as the Jaguars were as they finished 31st in the league with 25 sacks, ahead of only Jacksonville. The team has nothing opposite Lamarr Houston at defensive end and their linebackers are a mess and should look to find some help in a deep draft for pass rushers. Remember when we all thought that Jordan's shoulder injury would make him drop his stock? Well his shoulder checked out just fine and he absolutely tore up the combine across the board. He may still be raw and should put on some weight but his stock is on the rise big time. You may have mentioned that I included Fisher's name in the discussion for the top overall pick and it is a discussion over whether Fisher or Luke Joeckel is the top offensive tackle in the draft. His stock was on the rise going into the Combine and he looked better than Joeckel in Indianapolis. Fisher has the athleticism and the flexibility needed for a big guy at tackle and he has got the skills you look for out of your blindside protector. Nobody knows what Chip Kelly is doing in Philadelphia and especially at quarterback but one thing he needs is to upgrade the offensive line and they have had troubles at tackle for year. You want to hear a joke? The Cardinals' offensive line. You want to hear another joke? No you don't, but anyways, the Cardinals have themselves a truly pitiful offensive line that was statistically speaking the worst in the league with allowing the most sacks in the league with 58 and having the worst rushing attack as well. Therefore, taking an elite talent like Warmack is a wise decision, in my opinion. Warmack should immediately help Arizona's run game because he is an absolute mauler in the run game and he is athletic enough to pass block well. Listen, I know that the Jets are an absolute mess at quarterback. Mark Sanchez has developed into a joke, Tim Tebow was never given a fair shot and Greg McElroy did not show a whole lot in his limited tryout at the end of the season. But, it is clear that the Jets are dearth of weapons in the passing game. Santonio Holmes is a quality wideout when he wants to be but he is unreliable. Stephen Hill showed why he fell in the draft a year ago with how raw he was and how he cannot catch (I'm sure those Jets fans who wanted him feel really smart right now). I do like Jeremy Kerley, but he's mostly a slot guy. Patterson may be raw but he is the most physically gifted wideout in the draft, with some folks comparing him in that regard to Julio Jones. The Titans do have themselves a solid pass rush, they tied for ninth in the league in sacks with 39, and they have a good defensive end pairing in Derrick Morgan and Kamerion Wimbley. But they are not very deep at the position and as we all know, teams love to stockpile pass rushers and you would think that new hire Gregg Williams would not mind if the team brought in even more firepower. I think Werner's stock may drop a little because he showed in the Combine that he would be a poor fit for a 3-4 and he isn't an amazing athlete. However, you cannot deny this guy's talent for rushing the passer. Miami's defense has been fortunate to have a guy like Randy Starks in their interior, as he has been tremendous rushing the passer from the inside of the defensive line. Heck, he was even in the Pro Bowl this year as a replacement for Vince Wilfork. But Starks is also a free agent this year and given the fact that he is likely to command a big salary, as well as the team having a few key free agents on the market, means that he may not be in Miami Gardens next year. Richardson truly was awesome in 2012 for the Tigers with 75 tackles, four sacks and 10.5 tackles for loss. He is an athletic big guy who moves well in the trenches and has the arms to bat down passes as well. You know who had a great secondary last year? The Buccaneers. After all, they were 32nd in opposing passing yardage and were that far away from allowing the most passing yardage of all time. They had to get rid of the malcontent Aqib Talib but that left them worse off, especially since Eric Wright was awful, as expected. So they really have to address the cornerback position and thus, Trufant makes sense here. Trufant has made himself a lot of money with brilliant performances in Mobile and Indianapolis and has shown tremendous coverage skills in man-on-man situations. Rhodes is another guy that helped himself at the Combine as he overcame fears that he lacked speed with a strong 40-yard dash time of 4.43 seconds and a strong 10-yard split of 1.47 ticks as well. He has impressive size and is physical against not just the pass but against the run as well. And not many teams could use some secondary help more than the Saints, who were spared by the Buccaneers of the honor of being the worst pass defense in the NFL and just like guys can never have too much mulch, you can never have too many cover guys. The Rams were much improved on defense this past year under Jeff Fisher's first year in town and a big reason was from the secondary, with one clear exception, at safety. New corners Cortland Finnegan and Janoris Jenkins did a solid job on the outside and while Quinten Mikell is a capable strong safety, Craig Dahl is garbage at the other safety spot and needs to be upgraded. What Fisher will appreciate from Vaccaro are his instincts in both the run game and against the pass as he has a good head for where the ball is. Moore is a guy that did not helped himself at the Combine. He ran a slow 40-yard dash time of 4.95 seconds, if you actually believe the official times, and while you can downplay a bad 40 time as a result of poor form or being overrated in general, what will really hurt will be his awful bench press total of 12 reps, which was the worst of any defensive lineman. That said, he was projected to be a high pick for a reason and that should allow the Steelers to take him at good value. And as we saw a year ago, their pass rushing corps could use an infusion of youth. Cooper is another draft prospect that has been on the rise and I think that this could end up being lower than where we will go in a couple of months. He looked very good in the field drills at the Combine and he ran a very good 40. Cooper is very experienced and has started every year in Chapel Hill. He is quick when blocking in the run game and is athletic enough to pass protect as well. The Cowboys could really use a guy like him in their interior offensive line considering that part really disappointed a year ago. Short may be the best pass rushing tackle in this draft class as he uses his strength and athleticism very well to press the pocket. He is also a not too shabby run defender, which Leslie Frazier would appreciate as well so he could keep Short on the field for three downs. Minnesota has had a hole at defensive tackle next to Kevin Williams since Pat Williams retired a few years ago and it is important to note that Kevin Williams is not getting younger, he will be 33 at the start of next season. The Colts' transition to a 3-4 defense did not result in a great pass rush as the team finished tied for 23rd in the league with 32 sacks. Robert Mathis has eight of those sacks and he was the only guy that could consistently apply any pressure on quarterbacks, and Dwight Freeney was recently cut. If the team wants to build a strong 3-4, they need some juice on the edge of their defense. Mingo came back after a great 2011 with a disappointing 2012 but thanks to his great speed and athleticism, he has a high ceiling and he is a great fit for the 34. The Seahawks have themselves a quality offensive line but they have one glaring hole and that is at right tackle. Breno Giacomini may be a friend of the blog and he may have a great name but he is not much more than a scrub and the team should look to find an upgrade. Fluker may not be the greatest pass protector in the world but he is an all-out mauler in the run game, which would come in handy with a team that features the run like Seattle does. Plus Fluker is also versatile and he should be able to be a pretty good guard as well. Don't get me wrong, the Broncos have themselves a pretty good defense. A sore spot would probably be at defensive tackle, where Justin Bannan and Kevin Vickerson are decent and nothing more. The bigger concern is that both guys are free agents and while they did just draft Derek Wolfe last year and like him, bringing in another talented tackle would be a wise move. Our good friend Jack Del Rio will appreciate Williams's versatility along the defensive line and he will also like Williams's stoutness in the run game as well as his underrated pass rush ability. The Patriots ended up really missing Aqib Talib in the AFC Championship as their cornerback play was trash and got they punished as a result. And the icing on the cake is that Talib is a free agent this offseason and not let's forget Alfonzo Dennard was just convicted for assaulting a police officer. So the team really needs to find some help for the secondary. Banks is a pretty big corner who plays the ball well and is also very aggressive in the run game and is pretty good in run support, although his Combine performance left something to be desired. It really should be a prerogative for the Falcons this offseason to find some pass rush, because they were really awful rushing the passer in 2012. They only sacked opposing quarterbacks 29 times this past season and the only guy that could provide any consistent pressure, John Abraham, who had a third of the team's sacks, is no longer on the club. Jones is a very athletic end who has a great motor from the point of the snap and his has a very good first step but he is a little raw. The 49ers already have themselves a great pass rush thanks to the tremendous play of Aldon Smith and Justin Smith, if they added another dominant rusher opposite the former Smith, their defense would become completely unfair. They also could use some more depth at the 3-4 outside linebacker spot as well so taking Okafor would make sense. Okafor is a talented speed rusher off the edge that has experience lining up at different spots and is a solid run defender as well. I don't think the Rams will go Vaccaro at 16. I think the Rams will go reciever, and draft a saftey later. Rams offense needs weapons, and Patterson and Austin will not fall to 22. The Packers already have FIVE tight ends on the roster, including Finley. They don't need another, much less in round 1. Ludicrous pick. They desperately need help at 3-4 De/ILB/SS/LT. NOT te. So it's ludicrous for a passing team to want weapons? Plus, Eifert is a good blocker that can help out the line. And of those five tight ends, two are guys that have barely seen action and have combined for two career catches. I like Williams but he is too small to be an every-down guy and while Crabtree is a national treasure, he's not a starter. Don't forget that the Packers love to feature three tight ends and Eifert may be the best player on the board at that juncture.